You are probably wondering what the top picture is and what it has to do with my running this morning…well Julia, Amber and I were on our way to meet a few other ladies (Rachelle, Carina, Josie, Janae- hungryrunnergirl, Rebecca, and we ran into Julie and Melanie) at the base of Provo Canyon. 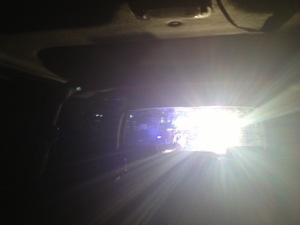 As I was driving a cop pulls up behind me. My speedometer does not work so I don’t know how fast I was going and then I realize that we don’t have our plates on our car (we have not picked it up from the car dealer yet… We were supposed to get it a month ago…). The police officer comes up and asks me why I didn’t have plates and I explained to him in a round about way that it was due to laziness. Then he asks for my license and registration… Well, I didn’t bring my wallet and our registration is not in the car. He then asks for my insurance card… Yeah… I didn’t have that in my car either. He took down my info and vin number and went back to his car. I thought I would be getting some type of ticket. He came back without a ticket and told me to get the plates taken care of!!! What a great morning for a run! Anyway, we ran 4 miles up Provo Canyon. It was a beautiful and fun run. No one brought their phone/camera and I am way sad about that! The leaves are changing colors and it was so beautiful. The company with the other runners was awesome and it made the run go by fast. It was neat getting to know some of the other runners better! It is great to share stories, to vent, to listen and to encourage each other, and I feel that that is what running is all about. We ran a total of 8 miles in 1:05.52. It was a good morning run! I saw part of your group this morning at the mouth of the canyon! It sure was beautiful! Hooray for a great run and pals! I wouldn’t want to do it without them! 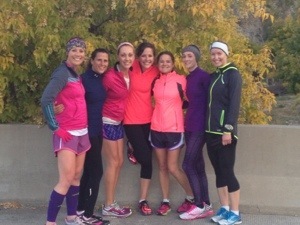 It is amazing how much running buddies help!